Level crossing safety is no joke. Many level crossings were built more than 100 years ago when there were fewer and slower trains on railways across the world. But with trains reaching higher speeds, the intersection of a road or path with the railway has become one of the most dangerous parts of railways. A number of rail infrastructure managers are conducting campaigns to either upgrade or remove remaining level crossings, which are high risk areas for accidents. 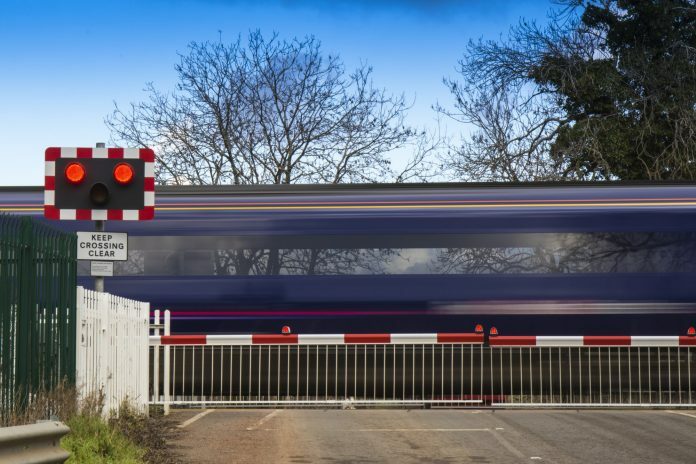 In the Netherlands, ProRail recently announced it wants to eliminate its last 123 unguarded level crossing “within a few years” and in the UK Network Rail has closed more than 1,000 level crossings since 2010. These videos, taken of railways from around the world, show just how dangerous level crossings can be and serve as a reminder to be prepared to stop, understand the warnings, and only cross a level crossing once you are sure it is clear. An impatient cyclist comes within inches of hitting a train in Waterbeach, Cambridgeshire, UK, after ignoring warning signals and trying to ride around the barriers. ProRail stresses the point that when the barriers are down a train could pass by at any minute with this video. A group of pedestrians hurry to beat a closing barricade and one of the party almost makes the fatal decision to follow in the Netherlands. From 2001 and 2011 there were 21 collisions between trains and level crossing users in the Republic of Ireland. This motorist finds themself lucky not to be among the statistics after almost pulling in front of a train at an unguarded level crossing. Stop, look and listen. A simple safety mantra that has an important message, underlined by this passerby who obliviously walks into the path of a train near Mt Eden, in Auckland, New Zealand. A lorry driver cuts into the path of a passing freight train, risking the lives of both himself and the train driver, in Dubbo, New South Wales, Australia. A startling clip from Poland shows a speeding driver break through a level crossing and somehow avoid a devastating collision with a train. Hazy cab footage shows a pedestrian casually walk across a level crossing despite a train passing through at Glan y Mor Elias crossing, near Llanfairfechan, Conwy, Wales. Another clip from Wales, this time a 4 x 4 driver makes the almost catastrophic decision not to stop and check at a level crossing, resulting in an extreme close call. The Australasian Railway Association and KiwiRail staged a collision in New Zealand to demonstrate not only the damage that could be caused in a level crossing accident but to highlight that some trains take 26 seconds to come to a complete stop. A sobering collection of clips, especially the last one of the staged collision in NZ. Speaking of which the fourth clip is from Mt Eden, Auckland in New Zealand, not Australia. Most level crossings have closed and have been replaced by bridges & underpasses aswell pedestrian level crossings that have closed and footbridges and foot-underpasses (subway) have been installed to make it safer to cross over & under the railway line (electrified & non-electrified). Unfortunately Andrew there are still places that have lots of level crossings Andrew. Obviously there are many in developing countries but even in wealthier ones topography makes a big difference. In Australia for example Sydney is a hilly city. Early railway development often followed the ridge lines which meant it was fairly easy to retrofit grade-separated crossings later, with the roads usually pasding underneath. As a result Sydney has virtually no level crossings. Melbourne is a different matter – it’s very flat and so ended up with dozens of level crossings which it has to this day. The Victorian agovernment has embarked on a major program to eliminate the worst of these by elevating significant sestions of railway lines, but this will take a few more years and millions of dollars to complete. Unfortunately Andrew there are still places that have lots of level crossings. Obviously there are many in developing countries but even in wealthier ones topography makes a big difference. In Australia for example Sydney is a hilly city. Early railway development often followed the ridge lines which meant it was fairly easy to retrofit grade-separated crossings later, with the roads usually passing underneath. As a result Sydney has virtually no level crossings.